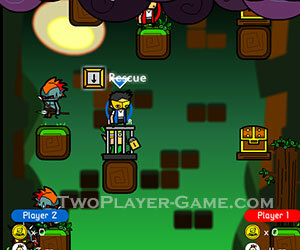 Vertical Drop Heroes, 2 player games, Play Vertical Drop Heroes Game at twoplayer-game.com. Move downwards as you rescue characters in cages to gain their abilities to kill enemies.Small heroes are fighting for saving their friends who were trapped and imprisoned. They must go into deep of the big vertical platform to rescue all of their friends.TwoPlayer-Game.com hopes you have fun. Arrow key Down - To rescue heroes. Arrow keys Left/Right - To move. Space bar - To use skill/ continue. S - To rescue heroes. A,D - To move.Shift key left - To use skill/continue.